It’s no secret that the views are much more spectacular from the Canadian side. But it goes a bit beyond that. Canada just seems a whole lot more colorful! I completely get where Frederick Olmsted was going (architect who designed Niagara Falls State Park as well as New York’s Central Park) with his intent to conserve the natural surroundings around the falls. I appreciate the feeling of authenticity of the “green space” as it winds its way along the edge of the river. 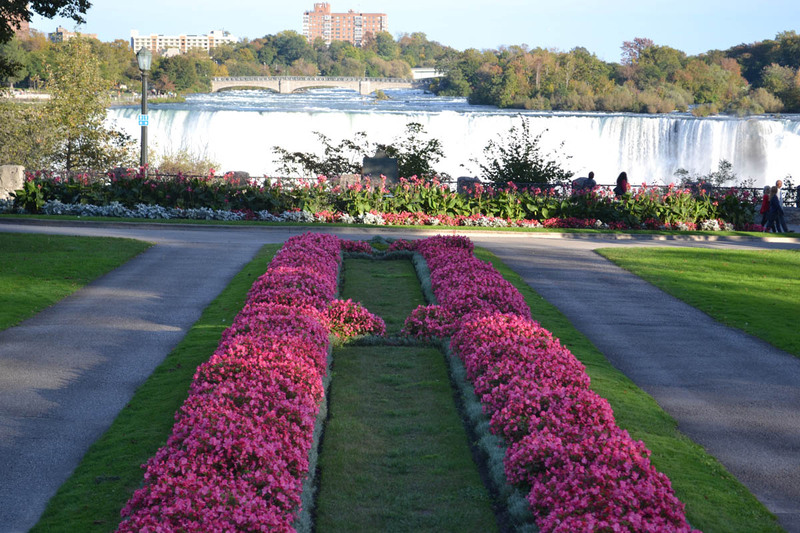 However, there is something quite uplifting and inspiring about the beautiful floral gardens that line the riverside path on the Canadian side. 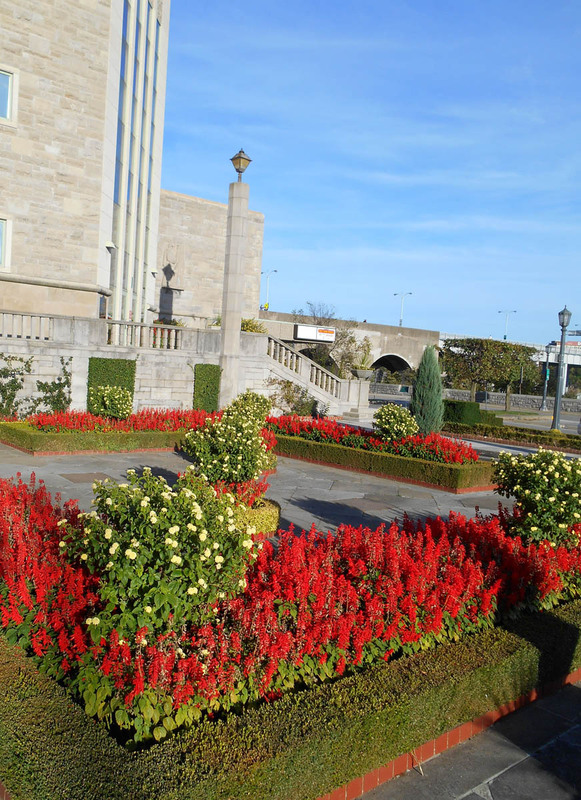 Even Elvis enjoys a stroll along the landscaped riverside path! 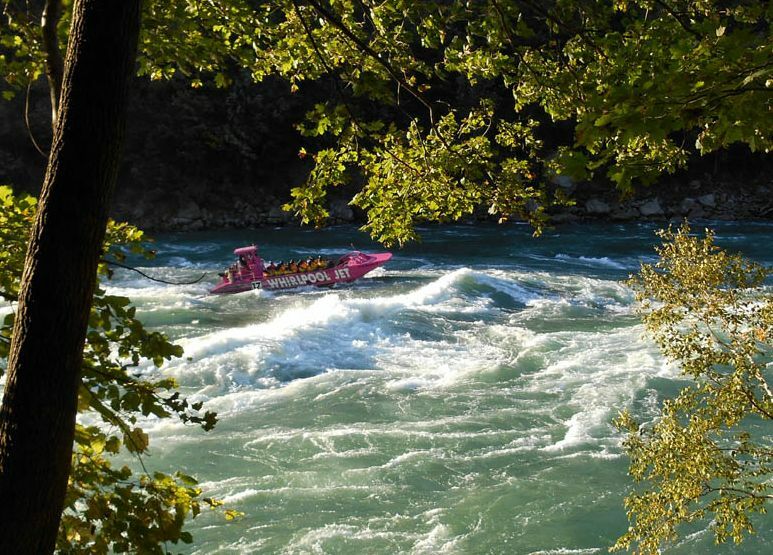 Here it comes, a jet boat full of screaming, flailing tourists, barreling up the rapids at “Hey! watch this!” speeds typically reserved for the Texas redneck jet skiers. 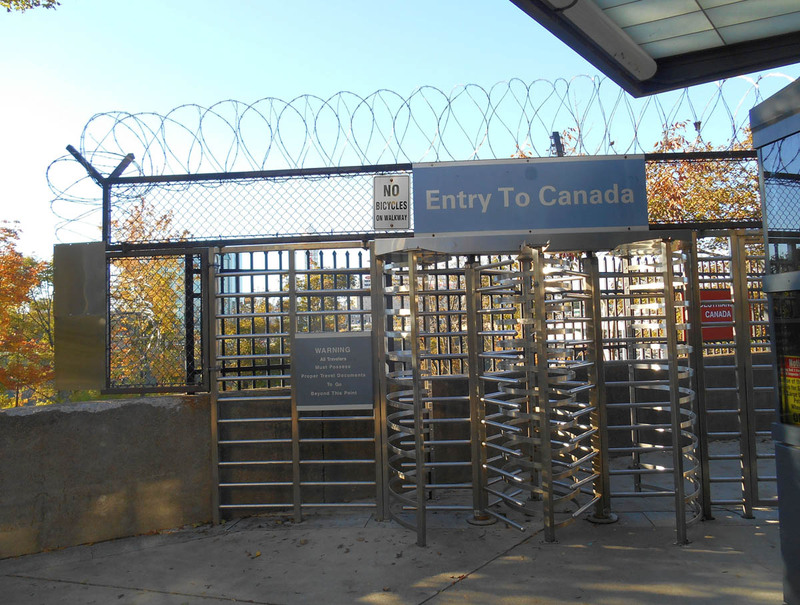 I walked across the Rainbow Bridge into Canada with a sense of accomplishment, having reached my northeastern most turning point in my east coast journey. At first I said I would be too afraid to navigate as far as New York in the Winnie while towing a car. 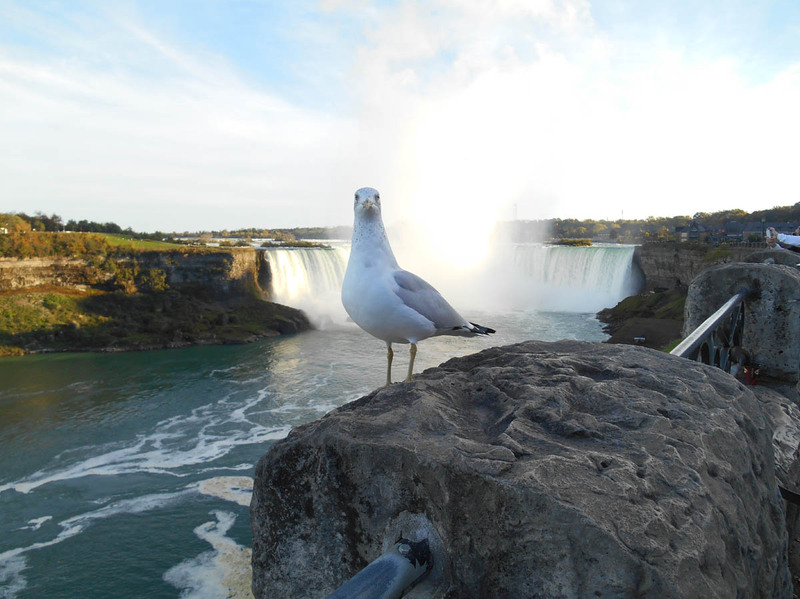 Then, I said I would just fly to Niagara Falls for my birthday, because I was too nervous to drive that far north. I am not sure what I was afraid of…making a wrong turn and driving the Winnie over the falls, I guess. So walking across the bridge and “tagging” the Canadian border all the way from Texas without having boarded a plane was a real milestone for me. 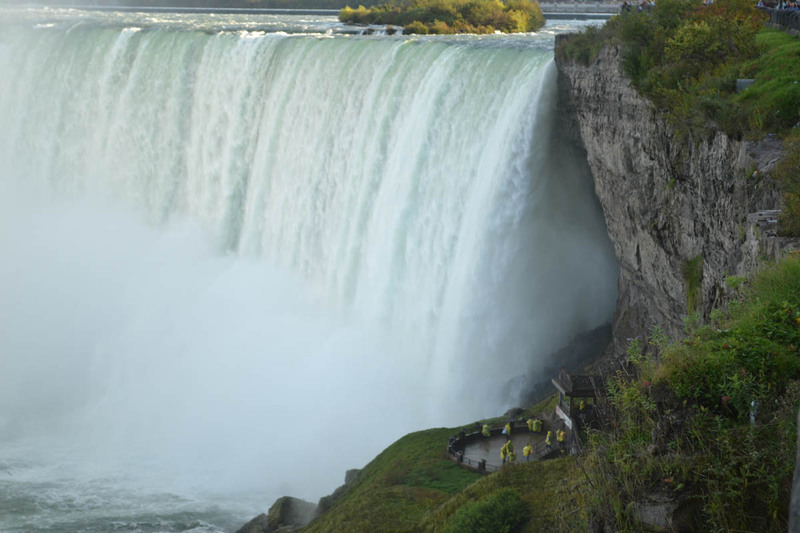 As if I had not had enough “soak your shoes” experiences, I opted for the “Journey Beneath the Falls” tour on the Canadian side, an elevator ride to the base of Horseshoe Falls. 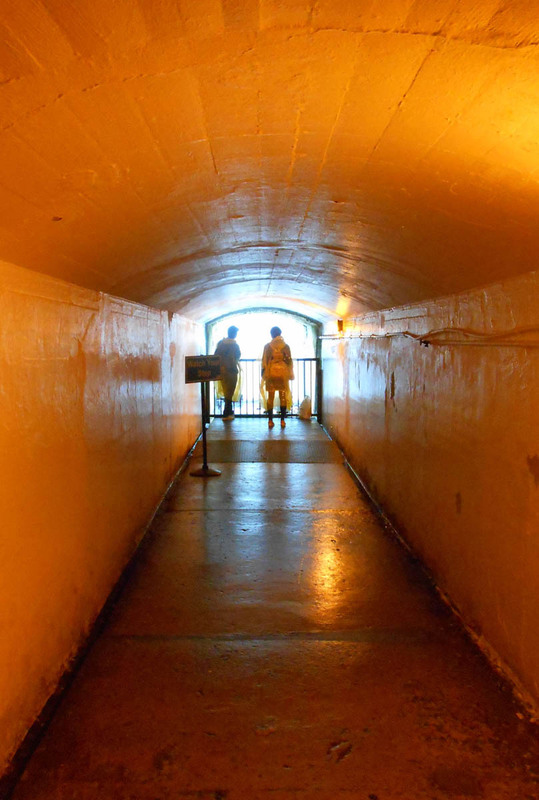 Tunnels lead one third of the way behind the falls with portals where you can stand and look out beneath the falls. The thundering sounds, dark water, and vibrating railing are just uncomfortable enough to keep the crowds moving. 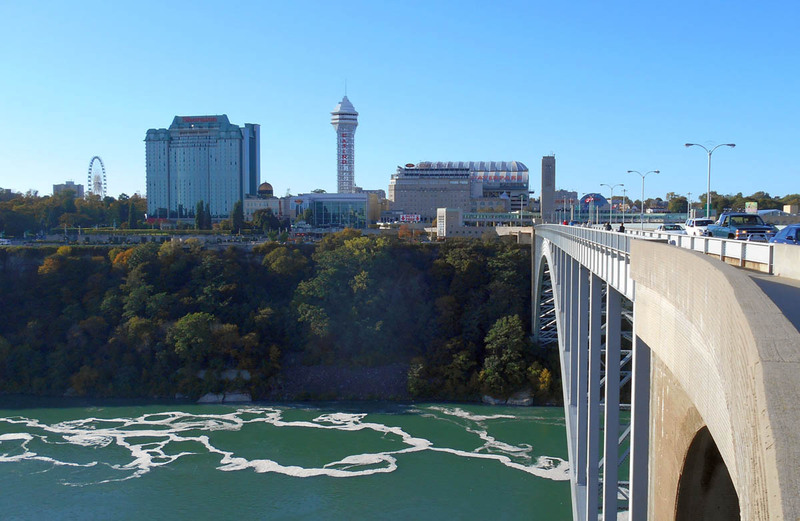 Note “Beneath the Falls” viewing platform in lower right. 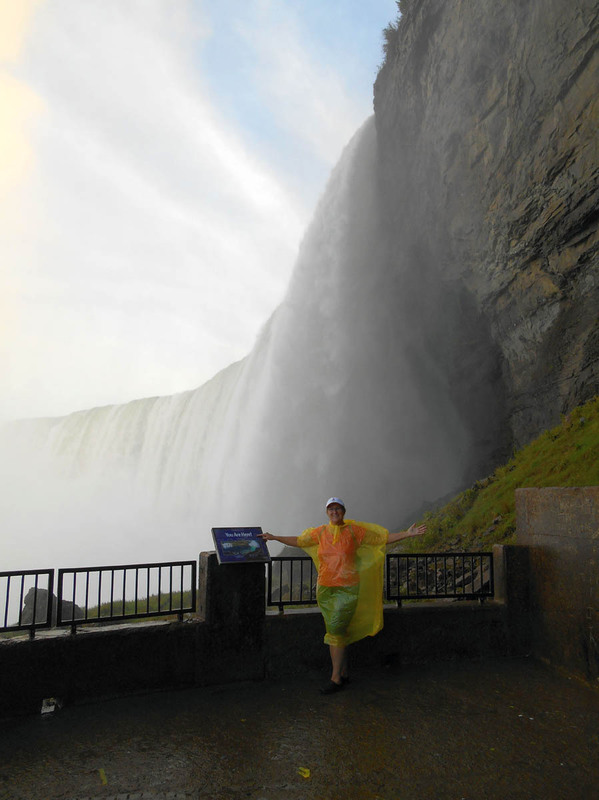 This entry was posted in Canada and tagged Canada, Horseshoe Falls, Journey Beneath the Falls, Niagara Falls by Suzanne. Bookmark the permalink. Awesome and hysterical photos! 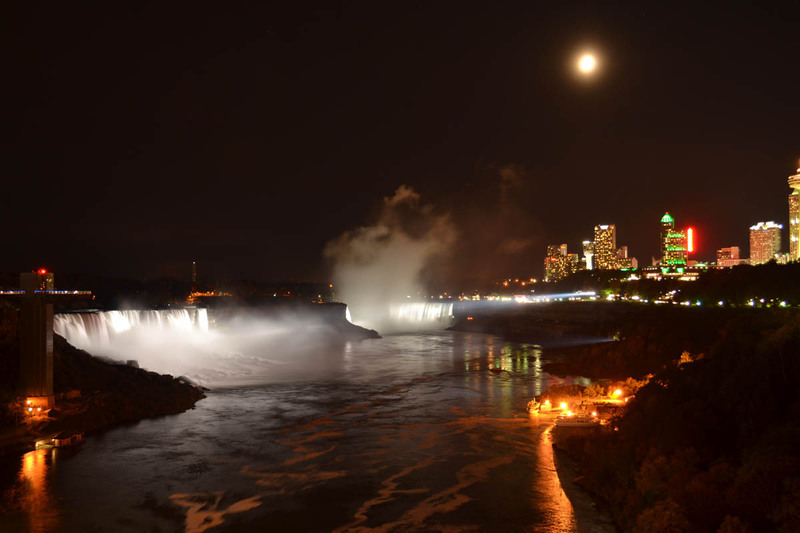 I never made it to the US side of the Falls, and after seeing these comparisons, it looks a bit “Cold War – East Berlin”-ish so I’m glad I never strayed from the Canadian side! 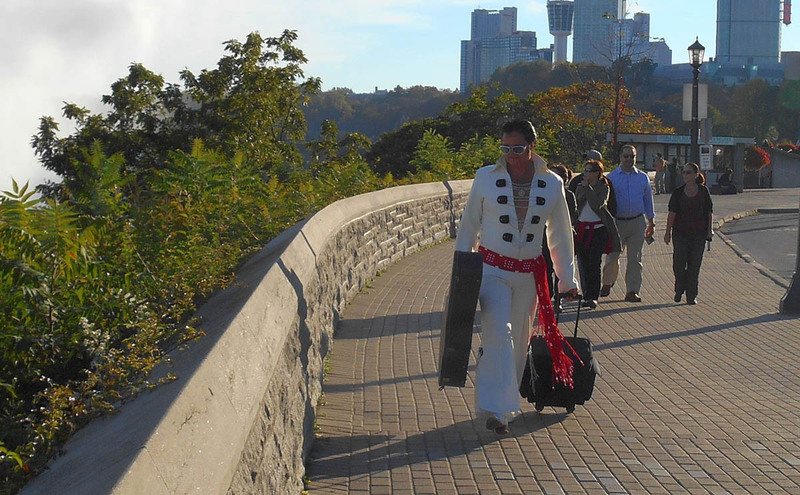 Well, very glad you enjoyed dipping your toe in Canada for a bit…and even got to see Elvis too! Hey, glad you made it over to Canukville, we don’t bite ya know. As we say in Canada, The West is the Best. You will have go West to see the really awesome parts of Canada. But then I am biased. You are like a Labrador retriever, can’t keep you out of the water. 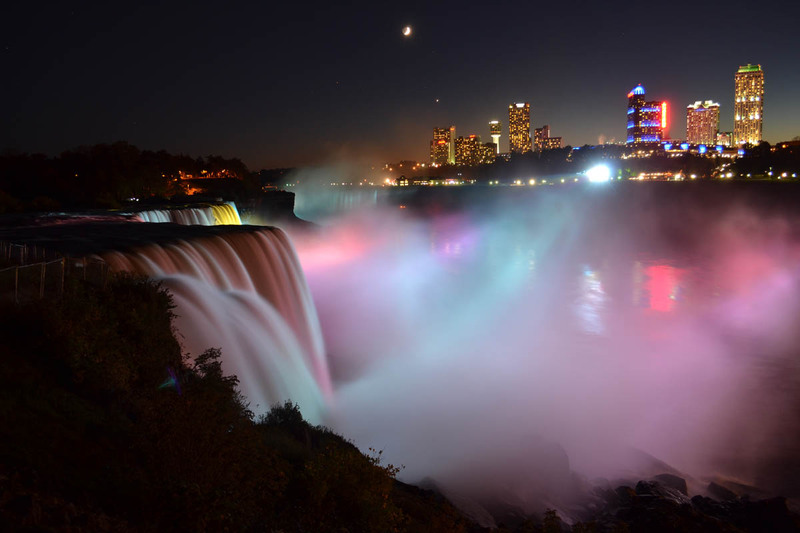 Great night shots of the falls! I agree with both the Lynn/Lynne’s on the views from Canada! Lynn, I also agree about the “West is Best.” I have spent a good bit of time there, from skiing at Whistler, hiking at Assinaboine Lodge, touring the glaciers and moraine lakes of Banff and Jasper, and eating steak in Calgary and tea at the Empress! But this one was different because I drove there! Well, at least as far as the bridge parking lot. LOL! 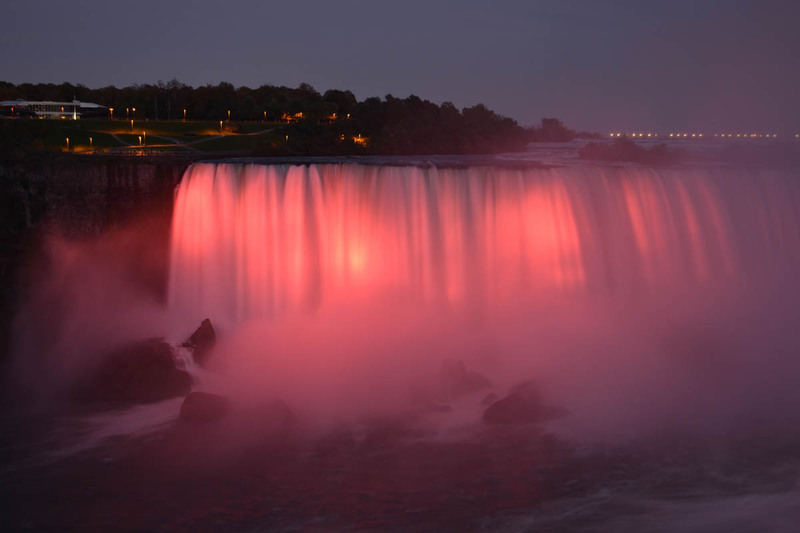 Those night shots of the falls are just terrific. Thanks, BCBM, any photo compliment is an extra special treat from a postcard-producer like you!